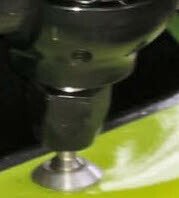 Specifically designed for reliable fixing of Spa or Racetech mirrors to the Caterham roll cage. With this mount vibration is minimised. A full height side screen can not be used with these mirror mounts; either run with no side screens or the half height version. Where the full windscreen is present, using our special adapter it is possible to mount a Spa mirror directly to the screen frame. If relevant contact us for details as to how this can be achieved. With this method of fixing the full height side screens can be used. Supplied with a specially designed adapter to allow fixing of a centre or side mirror to the roll cage. . Please specify if the mounts are required for Spa or Racetech mirrors. Note: These mounts will only fit the 32mm. 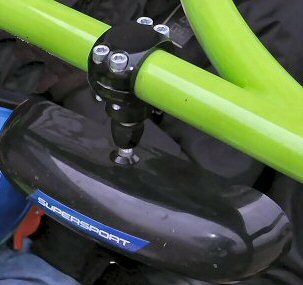 diameter race roll cage as fitted to current Caterham race cars. A special adapter is supplied to fit the roll cage mount to the Spa or Racetech mirror. Our Spa mirrors are supplied already fitted with the special black nut required to mount directly to the DPR mirror mount.